Double Take Records is a Los Angeles based company featuring new indie artists. It is the music side of the production company Double Take Entertainment Group, which specializes in independant film production. Double Take also has a full digital studio and master suite which is available for recording sessions at an hourly rate. For more information about one of our artists or our studio rates please contact our staff via e-mail. Just click the CONTACT link. Todd Eric Valcourt, a Los Angeles rocker, is working on the final touches for his newest CD entitled Tragic. Double Take Records currently offer a new 4 song demo as well as Todd's last CD. Both are available in the Double Take Store. 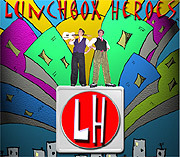 Lunchbox Heroes, Los Angeles based children's band, has a new CD now available. Double Take Records is proud to present the newest member of their family. Pick up their CD today! For more info on the band go to their site at www.lunchboxheroes.com. MORAG, a Los Angeles rock band featuring the vocals of Morag MacPherson, has a live CD available. Double Take Records are currently working on a new CD to be released sometime in 2007. For more Double Take performers click the ARTISTS link.